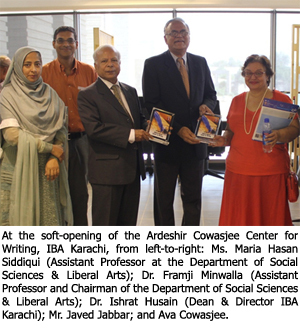 In a unique initiative to enhance writing skills in its students, IBA Karachi's Department of Social Sciences & Liberal Arts is launching the Ardeshir Cowasjee Center for Writing at the Main Campus. 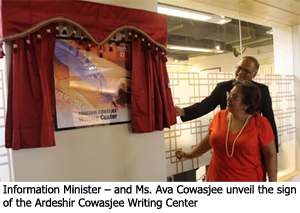 The Center has been dedicated to the memory of Ardeshir Cowasjee, one of Pakistan's most-renowned columnists, social activists, and philanthropists. Pending its formal inauguration early next year, IBA Karachi held a soft opening on November 1, 2013 in the newly-completed Student Center. Dean and Director, Dr. Ishrat Husain, speaking on the occasion, paid tribute to Cowasjee, saying that "Influential leaders need to have strong communication skills, of which writing forms an integral part. We have named the Center after Cowasjee as a dedication to a personality who was a beacon of hope and a loyal adherent to the teachings and philosophies of Quaid-e-Azam Mohammad Ali Jinnah." He expressed his hopes that the students of IBA Karachi will avail this opportunity to follow in the footsteps of a great man who used the power of the pen to effect change. Dr. Framji Minwalla – Assistant Professor and Chairman of the Department of Social Sciences & Liberal Arts – along with Ms. Maria Hassan Siddqui, Assistant Professor at the Department, introduced the concept behind their initiation of such a center. "The ability to write effectively is one of the key markers of academic and professional success. Effective writing indicates clear thinking, the ability to assimilate and synthesize complex material, and an appreciation for nuance and differing points-of-view," said Dr. Framji during his presentation. He went on to say: "Given that reading and writing are interdependent activities, good writing also indicates an ability to read complexly—a necessary skill for students entering the increasingly competitive 21st century workplace." He iterated the power of writing as an agent of change, as he mentioned Cowasjee's contribution to an amendment in the Constitution of Pakistan, which has a footnote dedicated to him. Ms. Siddiqui elaborated that such a writing center at IBA Karachi will go a long way towards helping achieve this goal. She said that the center will not only help students, but also "serve all faculty members by helping them design and sequence writing and research assignments, devise strategies for evaluating and responding to student writing, and develop effective techniques for working with multilingual students." The Center will offer a number of customized services, seminars and workshops to students, faculty and staff in helping improve written expression, working on assignments and addressing writers' block. Former Senator and Information Minister, Mr. Javed Jabbar, the Guest of Honor and the Director of the Center, commemorated Ardeshir Cowasjee for his immense courage in effecting change; he said: "Cowasjee, hailing from a microscopic minority in Pakistan, had immense self-confidence, courage and ferocity to challenge power." He held Dr. Ishrat's efforts in high regard for the "giant leap forward that IBA Karachi has taken under his leadership in the way of furthering and reaching new levels in academic excellence in Pakistan." He concluded by saying that the Center has been aptly named after "an individual as distinct as IBA itself." Ava Cowasjee, daughter of Ardeshir Cowasjee, remembering the great works of her father, thanked IBA Karachi for honoring him and his memory, celebrating his belief in education and the power of writing as a form of liberation.